An ordinary Friday morning and I go out to the barn to feed the goats and do the morning check. Everything is as it always is, or, at least, as it has been since the babies were born. And then I notice little Doris, looking, well… poofy. She’s puffed up and her fur is sticking out like she’s a scared cat trying to make herself look big. She’s affectionate, but her spark is not there. She’s not jumping at my legs the way she usually does. 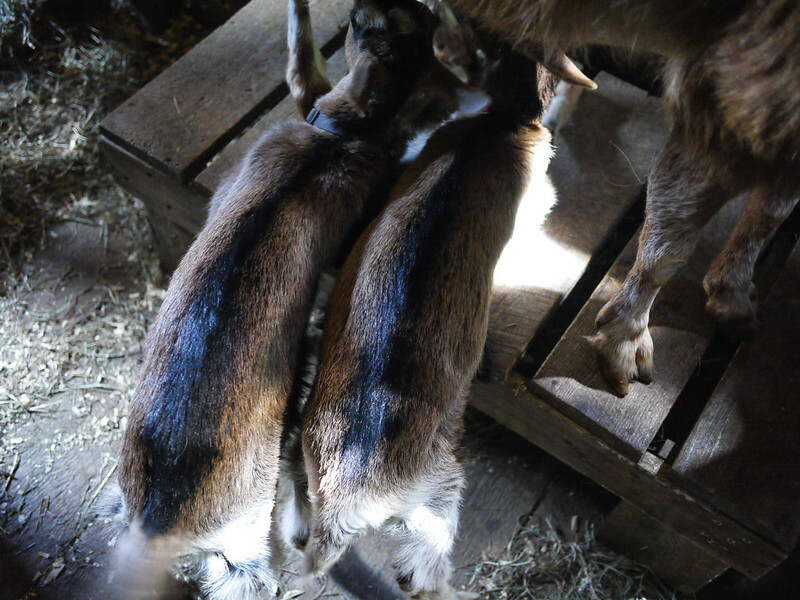 I know something’s not right, but I’m not entirely sure what it is because we’re still relatively new to this goat thing and our goats have been overall healthy so far. I go in to ponder it, and do a little reading online. I’m pretty sure it’s bloat before I even start to look, but I look anyway. Right. Into the car I carry her. I have no goat carrier. I put her in a laundry basket, but she’s soon out of that (sick or not, she’s still got baby goat curiosity). I stop the car and she I finally agree that she can lie down on a pile of towels on the floor right behind the driver’s seat. I’ve finally become one of those funky, Vermont women who drives around with a goat in her car. I want to smile at the notion, but I’m too worried. All the way to the vet, I’m singing to Doris. I’m singing her sister’s song (“Darcy Farrow”) over and over again to keep her calm. I keep getting to the part where Darcy Farrow dies, then I circle around again to the beginning and try to keep those thoughts out of my mind. I should have picked a happier song. At the vet’s office, she’s examined. After an x-ray (which reveals gas bubbles), the vet looks me straight in the eye. “This isn’t good.” I was already a little queasy, now I feel dizzy. Doris is tubed (to remove gas from her stomach), aspirated (to remove gas from her rumen), given a dose of oil (to help consolidate the gas bubbles), given lactated ringers (for fluid and nutrition), given antibitoics, given her baby shots (since she’s due anyway). Back into the car and we go home. I can’t put her in the barn because we’ve been warned we need to keep a steady eye on her and not let her eat anything. She’s still bloated; there’s only so much gas the vet can get out of her, and (the vet warns us) Doris is in guarded condition and may not last the night. We put her in the downstairs bathroom. Yes, in the span of one morning we’ve moved from people who keep goats in the yard to people who drive them around in the car and let them sleep in the house. I hear it eventually happens to everyone who owns goats. We take turns being with her. The dog is inconsolable. He’s on the other side of that bathroom door and wants to be with us, with her. We even let him in for a bit. The goatling doesn’t care. She’s miserable. More trips to the vet’s office that afternoon, the next morning, the following Monday. More of the same treatments. She’s not getting worse, but she’s not getting better. Eventually, we put her back in the barn, in a clean stall, so she can be near her mother and sister. When you’re a goat, goat company is better than human company. Little by little, she starts to get smaller. She nurses vigorously. She starts to generate “output”. The sparkle comes back into her eyes. She moves around more and doesn’t just lie or stand there trying to breathe. Today, if you looked at her, you’d never know how sick she was. Eleven days later and she’s as slim and healthy seeming as her sister. She’s not out of the woods yet, though. For now, she’s still indoors, resting her system, rebuilding the bacteria (slowly) in her rumen, biding time until she’s bigger and healthy enough to face the fresh green growth outside. Oh, but it’s lovely to see her play, and jump on our laps, and chew a mouthful of dry hay, and nurse from her mother, lined up against her sister, two little stripes of perfect contentedness. We all finally feel like we can breathe. Hooray for healthy goats! Awww. Hope she keeps improving :D.
“I’ve finally become one of those funky, Vermont women who drives around with a goat in her car.” The best line I’ve read in a long time R. So glad Dory’s back to 100% goatadorability. Rebecca, randomly chose this morning (5:30 AM) to treat myself to a long-overdue look at your blog, along with my cup of coffee. First read the whole story of the ailing and now recovered goat baby. Then sipped and dreamed amongst the incredible photos…lovely, all! Thank you. Ready to begin my day. So glad little Doris is back to her cute little goatlet self. She had us all worried. What an ordeal! Happy to hear that things are vastly improved and I am thinking with every confidence she will pull through in fine style. Thanks so much, Kayte! She’s doing great today. Tough little goatlet.